water, cream, parmesan cheese (cultured part-skim milk, salt, enzymes), modified cornstarch, contains less than 2% of the following: butter (cream, salt), salt, sugar, enzyme modified egg yolks, whey protein concentrate, xanthan gum, black pepper, lactic acid, natural flavor, gum arabic, sodium phosphate, enzymes. contains: milk, eggs. 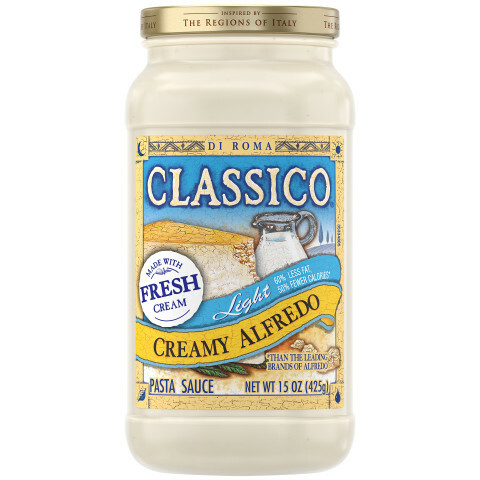 Classico® Light Creamy Alfredo has 65% less fat and 55% less calories than the leading brands of alfredo sauces, but all of the rich and creamy taste. This better-for-you indulgence is made with real, high-quality ingredients like cream, Parmesan cheese and butter. Use this for several recipes and whole family enjoys it. Thanks for making this healthier version of a usually fat and calorie laden sauce!! Chicken Alfredo Pasta Bake is in the oven as we speak. I am on a low-calorie diet and this stuff is great! I am still able to have yummy alfredo pasta! 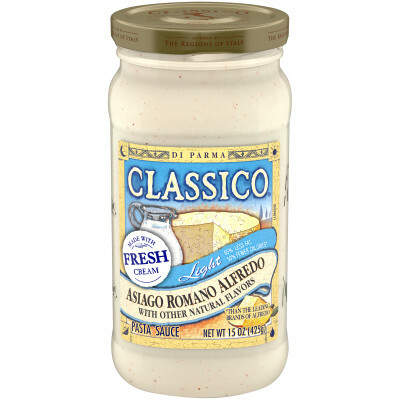 This is a fantastic sauce for those looking to enjoy the alfredo taste and maintain a healthy calorie intake. Of course it does not taste exactly like full-fat alfredo sauce - it doesn't have 100% of the same creaminess to it - but it is a great option that maintains the flavor and appeal.